According to the Environmental Protection Agency (EPA), “hazardous materials are materials that are dangerous or potentially harmful to individuals health or the environment. Hazardous materials can be liquids, solids, gases, or sludges. Hazardous material can be detrimental to the environment and harmful to society if stored or disposed of improperly.” Read below to learn a compliant process for storing chemical drums and totes with a chemical tote storage building. Chemical tote storage building with mechanical ventilation, temperature controls, and push back racking for efficient operating processes. Chemical tote storage buildings provide a safe and proactive storage solution for containing hazmat and waste compliantly. 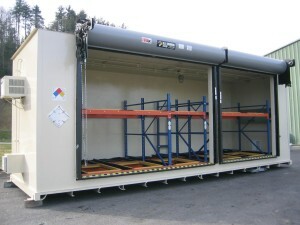 Tote storage buildings are designed to store chemical totes, one or two deep, with ample room for forklift access. Racking systems are installed to provide efficient and organized chemical tote storage. These buildings can be equipped with climate control systems to maintain temperatures, ranging from 35°F to 175°F+, depending on the nature of the chemicals being stored and geographical building placement. Whether storing fertilizers, pesticides, corrosives, flammables or wastes, pallet and tote storage buildings by US Chemical Storage offer safety and security to ensure full compliance. These pallet and tote storage buildings are professionally manufactured, and continuously welded by hand using heavy-gauge steel to provide a safe, secure, and compliant chemical storage atmosphere, internal and external to the standing structure. Chemical tote storage buildings are professionally engineered to meet EPA, OSHA, NFPA, IBC, IFC regulations, while meeting FM approvals and Warnock Hersey standards. Our certified welders and professional engineers make sure that every chemical storage building is safe, dependable, and fully compliant. Each building offers a 15 year structural warranty and a weather-resistant two-part epoxy top coat for an increased lifespan. Optimize your chemical storage building with our wide variety of customizable chemical accessories; including mechanical ventilation, explosion proof accessories, temperature controls, alarms, liquid sensors, gas detectors, door systems and more. Contact us online or call 888-294-2729 to speak with a sales engineer to learn about compliant storage solutions for your chemical totes.